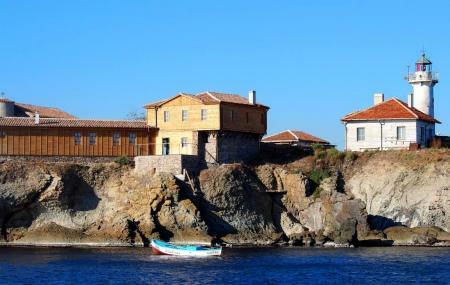 The only inhabited island off the Black Sea Coast has an interesting history. There used to be a convent here that was built in the middle ages, but when the island was transformed into a prison in the1920s, it was abandoned. When communist prisoners escaped the island, and later came to power, they renamed this isle as the Bolshevik Island. Today, visitors to the island will find pubs, restaurants and accommodation. There’s a lighthouse that you may walk up to, and a small museum on the island’s history to visit. There’s a beautiful, small chapel. BGN 9 ferry ticket for kids and elderly. BGN12 ferry ticket for adults. Tickets must be bought at the boat in Burgas. The ferry ride takes 30 minutes. You can only get here by ferry from Burgas. How popular is St. Anastasia Island? People normally club together Harmani Beach and Action Aquapark while planning their visit to St. Anastasia Island. People also prefer to end their day with St. Anastasia Island. The atmosphere of this island felt when the last group of tourists left at 20:00. Suddenly the island woke up. With the dull noise of the engines of the last boat with tourists, the song of the birds that had overcame the crowd began to intensify. There were four people on the island and the dog named Anastasia. I strongly recommend staying overnight on this island. Beautiful place, very helpful and friendly people, really worth while a visit. Very beautiful place,it might be small, but it's worth to be seen! The restaurant has a typical menu,the church is authentic and the views are stunning! They have the little cafeteria/there is a typical name,not café/ authentic as in the past. Plus there is the lovly boat trip until you get there! Something worth seeing!